To navigate this section click on any serial number in the boxes below to take you directly there. Alternatively you can use the right hand scroll bar to browse down all listings. If a serial number is coloured white in the boxes, no other info is known yet but the aircraft has been identified as belonging to113 Squadron All DATES are recorded in DAY/MONTH/YEAR format. The following are the Blenheims on charge with 113 Squadron known to date, be aware there are errors and it is incomplete. Further listings will be added as they are identified. IMPORTANT NOTE: Not all serial numbers are known but a date for a particular loss might be known, also scan down the page for the date you are seeking if you do not see the serial above. Blenheim Mk 1's transferred to other squadrons: L1528, L4825, L8443, L8537 were given over to 211 Squadron. L4823, L6662 to 203 Squadron. 12/06/1939 L1527 Mk 1 The Squadron trashes it's first new Blenheim L1527 when the under carriage failed to lock and it collapsed on landing at Heliopolis. 02/10/1939 L8442 Mk 1 Heliopolis, Squadron trashes another Blenheim L8442 when an engine cut on takeoff at Heliopolis causing it to crash. The aircraft was destroyed by fire but F/Lt Dallamore and crew escaped uninjured. NOTE: LAC Corp Norman Say (A Flight) records in his memoirs the following excerpt; "In the early days in the desert there was a certain amount of decency between the opposing air forces. The Italians would drop letters from prisoners of war for their families and the identity tags of airmen who had been killed and we reciprocated. It was this way that we learnt of the death of the aircrew of the first plane we lost." This is incorrect in this particular incident, but Corp Say could have meant First aircraft we lost 'resulting in the' crews deaths in which case he was likely talking of the June 29 raid two weeks later, when two crews were lost. 29/06/1940 L8436, Mk IV, FTR, damaged by flack while bombing El Gubbi and ditched into sea off Bardia, P/O D Pike , Sgt R. Lidstone and Sgt J Taylor rescued and became POW's. Sgt Bernard Shelton was friends of the A/G on L8436 and comments in a letter home: "The pilot tried to get it back over the border, but failed and they came down in the Mediterranean and the crew were picked up by the Italian Navy. Apparently the crew are now being held prisoners of war in Libya". THE FOLLOWING IS AN EXCERPT GIVING THE ITALIAN PERSPECTIVE: .........At sunrise on 29 June nine Blenheims bombed the airfield of Tobruk T2. Three CR.32s of 93a Squadriglia, 8o Gruppo, 2o Stormo C.T. and three CR.42s of 77a Squadriglia, 13o Gruppo, 2o Stormo C.T. scrambled under the falling bombs to intercept them. Tenente Giulio Torresi of 77a Squadriglia reached the bombers at six-o'-clock and attacked the last Blenheim which, after three strafes, caught fire and fell. Then, avoiding defensive fire, he attacked another bomber and shot it down. Sottotenente Gian Mario Zuccarini of 93 Squadriglia and Sergente Maggiore Fausti shared a third Blenheim and then, following the formation out over the open sea, they claimed another two, one each. Another Blenheim was shared by the other pilots, which damaged two more. It seems that they have been involved in combat with Blenheims from 113 Squadron, which lost three aircraft. L8436 flown by Pilot Officer Pike was damaged by flak and ditched. L8447 flown by 31-year-old Flying Officer Walter Ronald Price Knight Mason (RAF no. 70450) was shot down in flames by fighters and at least the pilot was killed. L8522 flown by 27-year-old Flight Sergeant Ralph Harry Knott (RAF no. 590277 was also shot down in flames by enemy fighters and at least the pilot was killed. Torresi, Zuccarini (who was wounded in a leg) and Fausti were all awarded with the Medaglia d'argento al valore militare after this combat. NOTE: The above is presented as found and has conflicts in several areas with the official records. 16/09/1940 T2052, Mk IV, crashed and burnt in night landing at LG15 Ma'aten Bagush on transit flight, P/O Eric Samuel Roberts (42362) the solo pilot killed. Buried El Alamein war cemetery. The following graphic description of this tradgedy is extracted from P/O Michael Shekletons diary: This evening was marred by an event so sudden and unexpected it affected us all. During the afternoon the Aboukir had delivered a new long-nose and Flights had armed it. A bit before dark young Roberts, lately arrived from the UK volunteered to fly it to the satellite. For some reason known only to them Group had cleared MB of aircraft for the night. There was, we were told, to be a squadron take-off from there at dawn for a Benina raid. Roberts took off rather later than planned but the satellite is only five miles away and there was ample time for him to do it in daylight. Dickie Squires was over at Fuka waiting for one of our kites that was promised by six pm. When he didn't return it was assumed he would be staying over because our Chance Light and crew was on loan to 211 Squadron and Dickie was aware of this. In the Mess at about eight we heard the drone of a Blenheim. The CO jumped up shouting, "My God! Dickie Squires! Lights, quick!" He dashed out followed by Bob and I. The CO's car was there and two pick-ups ready for the morning. We all tore through the camp to the strip and made a row with headlights on. Bob's pick-up had a Very pistol and a torch. We stood looking up at the sky and quickly located the errant a/c. It was making a wide circle to the north with its nav lights on. Just as Bob was loading the Very to indicate our position to our bewilderment Group's siren started up and a moment later the a/c which had turned beyond Group and was now headed toward us was caught in a hail of light flak. It came on towards us rapidly losing height in what seemed to be an approach. Group sounded an all-clear but by then the a/c which or may not have been hit had climbed again and was headed toward the satellite where, as we heard later, a flare path had been laid out and probably picked out by the pilot. The CO said he'd drive over there and 'pick him up' meaning Dickie, and Bob and I drove to the Ops tent where Jock was standing anxiously at the entrance. Seconds later engines sounded again and a Blenheim dived into the airstrip with an almighty crash followed at once by the heavy thud of 250s exploding. Bob jumped straight back into the pick-up and I piled in after him. He drove toward the fiery mess. Bob had done a bit of thinking and at once eliminated Dickie because that machine would not have been bombed up. But I had forgotten Roberts. We stood and watched as the machine burned itself out. No one could get near it though the fire0truck hurled gallons of water at it. Roberts had already done some months of operations from the UK and had flown the Blemheim out from there to Egypt. His log book revealed he had made lots of night landings though none out here. Bob had flown with him and judged him to be an excellent pilot - indeed he had already asked Barney if he could have him for A Flight to replace poor Victor. He was only nineteen. 18/09/1940 T2048, Mk IV, FTR, from raid on Tmimi, shot down by CR.42's, S/Ldr J. Keily DFC, AFC (Barney), baled out and captured, P/O John Sisman Cleaver , Sgt. J. Jobson KIA. Buried in Knightsbridge war cemetery Acroma, Libya. Sergente Maggiore Basso served in the 13o Gruppo of the 2o Stormo C.T., which was operating in North Africa and equipped with Fiat CR.42s. On 18 September 26 CR.42s led by Maggiore Revetria of 13o Gruppo intercepted nine Blenheims at 3,000 feet over Tmini. The British bombers had released some bombs over the airfield and were turning to make a second pass. Tenente Guglielmo Chiarini, Sergente Maggiore Basso and Sergente Porta each claimed a Blenheim. After following the bombers Chiarini was wounded in a shoulder and forced to abort while Basso claimed his second bomber. A fifth bomber was claimed as a shared. 113 Squadron reported that one of their Blenheim Mk.IVs was shot down in flames, and claimed to have destroyed one of their attackers and possibly a second. No CR.42s were however lost but several were hit. TOTAL: 2 and 1 shared destroyed claimed in combat with Blenheim Mk.IVs from 113 Squadron. Italian fighters claimed five but 113 Squadron only lost one aircraft. NOTE: The above is presented as found. 27/10/1940 T2068, Mk IV, FTR, became lost on return from Benghazi, abandoned in air near Amriya, F/O P. Squires , Sgt Durrant , Sgt Hancorn safe. Sgt Joseph Crawford, 648647 Missing FTR 09/12/1940. NO LOSSES LISTED THIS DATE ???? 20/12/1940 T2059 Mk IV, FTR from sortie to LG68 (Waterloo), F/O V. Firth , Sgt E. McKim , Sgt G. Lyle KIA, commemorated on Alamein Memorial. 11/02/1941 R3917 Mk IV under repair at 31 Air Stores Park at El Adem and was destroyed when the hangar caught fire. 06/04/1941 T2168, Mk IV, Record states: overshot landing at Niamata and ran in to Canal on return from Petris. From log book of Sgt JD Woodcock: Blenheim T2168 on a solo night bombing raid 06/04/1941 to Petrich Bulgaria. Here they encountered AA fire which holed the fuselage in numerous places following which the aircraft crash landed back at base. All crew survived. 14/04/1941 T2177, Mk IV damaged by friendly AA fire when attempting to drop unfused bombs for NZ Sappers to destroy a bridge, on returning to Larissa the undercarriage collapsed and they found that the Eastern Wing HQ had been evacuated leaving them stranded there. P/O G. Green, Sgt Gingell, and Sgt Jamieson unhurt. Aircraft was further damaged during air attack on 15/04/41 and abandoned. LAC Sgt. Norman Say comments in his memoirs: I did hear later that after we evacuated the Larissa airport the German paratroopers arrived there the next day, and some months later we saw a picture of them examining our aircraft in Picture Post. Also we were told that our kitbags had been collected up and Lord Haw-Haw read out our names as having been killed in Greece. I don’t think anyone at home heard about it. SOURCE: This picture has been published extensively in numerous books and newspapers. This particular one is from K Crawford, others from newspapers are on file with various captions. One of the crew members I believe wrote a story about this incident but I have yet to re-find it. 15/04/1941 T2054, T2069, T2169, T2182, T2186, T2216 all destroyed on the ground at the 113's new base at Niamata by strafing enemy 109's. Later this day following five more attacks, all the rest of 113's aircraft were destroyed including their Miles Magistar used for communications. The squadron evacuated the area by fire tender and commandeered road transport as all of its other vehicles were destroyed. 07/05/1941 L8444, Mk IV lost in Greece or Crete cause not recorded. 30/05/1941 T2183 abandoned in Crete, no further details known. NOTE: As recorded above the losses for the period in greece total 11 aircraft. These are T2168, L9338, T2177, T2054, T2069, T2169, T2182, T2186, T2216, L8444*, T2183*. The loss dates of the last two are questionable. 02/07/1941 V5928 Mk IV, FTR from raid to Derna, F/O J. Middlehurst , P/O J. Shepherd , Sgt. J. Rooney KIA. 06/07/1941 V5507 Mk IV, engine hit in raid on Gazala, made single engine belly landing at Fuka. No injuries to crew. 08/07/1941 V5793 Mk IV, destroyed in raid by Me 110's on LG15. In juli gingen de Me 110's verder met het uitvoeren van grondaanvallen en leden daarbij weinig verliezen. Op 8 juli om 08.00 Hr vielen enkele Me 110's het vliegveld van Maaten Bagush aan en vernietigden een Blenheim van no. 113 Sqdn aan de grond. 09/08/1941 V5990, Mk IV FTR shot down by friendly RAF night fighter off Mersa Matruh in raid on Bardia. Sgt G Woodroffe OBS, Sgt Greenless WOp/ Ag KIA, Sgt Sands the pilot survived. 19/08/1941 T2113 Mk IV tail damaged and broke off when it struck rocks recovering from a dive, crashed into the sea near Ras el Kenay Islands. It is believed that Sgt Norman M Gregor was the pilot of this aircraft and Desmond Arthur McLeish (AC-1) was also aboard as acting gunner or Obo. It is known that the squadron used a reef around this time for target practice and that there had been one or more aircraft losses so the practice was stopped. NOTE: Ras el Kenayis is in Egypt East of Maaten Bagush near the sea, this was the main camp for the New Zelanders MG division in Sept 1941 in preparation for General Cunninghams offensive. 22/09/1941 (Serial unknown) LG15 Bir Zimla / Sidi Haneish. On the 22nd of Sept F/O Brooks was conducting night bombing practice. An F.A.A. Albacore dropped flares over the landing ground with two Blenheims making practice low-level bombing runs on the L.G. During the exercise one taxied into a slit trench, and the other went too low and crashed. The pilot F/O Brooks was killed and the Ob. received two broken legs. Source: Sgt Ewan Brooking and CWGC. Note that the CWGC lists F/O Brooks as the Observer & not the pilot. 20/10/1941 V6030 Mk IV, ran into soft sand on landing at Giarabub and overturned. NOTE: This day of the 20th according to W.O. L Walker log, during op's to Gambut they were attacked by 8 to 10 109's and 2 Blenheims were missing, this reference is with certainty the two aircraft above, one being that of 55 Squadron. Note that a record of this loss can not be found . 24/10/1941 V6464 Mk IV engine cut out on takeoff at Qasaba, belly landed on rough ground. 01/11/1941 Z5907 Mk IV engine fire, crash landed by Ma'aten Bagush. 19/11/1941 Z5866 Mk IV crashed just after take off at Giarabub cause unknown. Sgt John Hemus pilot, Sgt John Dewar Obs, Sgt William Lee WOp/Ag all killed. Sgt John Hemus and crew, Sgt John Dewar Obs., Sgt William Lee WOp/Ag had recently arrived on the Squadron and were killed on 19/11/1941 in a tragic accident while at Giarabub when their Blenheim crashed on takeoff killing all onboard. Sgt Hansen states: while at Giarabub a Blenheim with a recently arrived Canadian crew on board crashed on takeoff. Sgt Hansen recalls "they had a motor failure and just managed to climb over the escarpment and crashed into a gully. The aircraft was on fire when we reached it but there was no chance of any rescue". (This crash described by Sgt Hansen is certainly Z5866 piloted by Sgt John Hemus, however only Sgt Lee was RCAF. Sgt Hansen thought the crew were all Canadian) Sgt George Checketts also confirms this crash. Note: This aircraft had been on dettachment to Malta with Sgt Baker, Sgt Checketts & crew per Checketts log. 25/11/1941 Z6438 Mk IV hit by light flak and returned to base but was damaged beyond repair. 26/11/1941 T2067-?A (DOUBLE NUMBER SEE 26/11/1940) Mk IV reported missing on raid, no further details squadron records lost in Burma. 12/12/1941 SERIAL ???? Sgt Leonard Purves RAAF, P/O Anthony Galvin RAAF, 2nd Lt Cedric Summersgill SAAF all KIA. Can not find record of an aircraft lost this date or where or how they died, they are buried in the Halfaya Sollum War Cemetery. Note photos of graves in personnel section show they were initially buried in Giarabub, such being the case this crash is very likely V5588 noted below. 14/12/1941 V5588 Mk IV crashed at Giarabub, no further details available. 13/01/1942 Z7790 Mk ?? Reported shot down by return fire from Ju52's off Malta. NOTE: 113 had left for India, either an error or was an abandoned aircraft salvaged for use by another squadron. 24/01/1942 Z7582 MKIV FTR from a raid on Bangkok, Sgt P Keeley, Sgt Dingle, Sgt D Briggs KIA On 24 January a night raid was made on Bangkok, all serviceable aircraft participating. The Blenheims attacked singly at ten-minute intervals, bombing from 2000 feet with a war load of four 250 lb. bombs and four 25 lb. incendiaries. Large explosions and several fires resulted. An intense anti-aircraft barrage was again encountered over the target area, and two aircraft, including Z7582 piloted by Sergeant Keeley, failed to return. 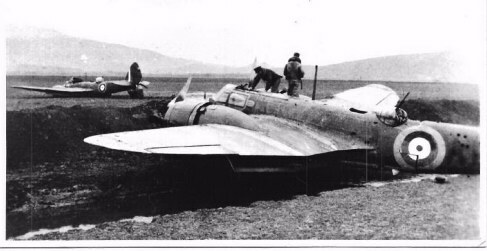 17/02/1942 Z7916 MKIV The official record states :Engine cut out on takeoff at Zayatkwin and swung off runway. The aircraft was later abandoned on evacuation of the aerodrome. NOTE:According to Sgt J Chapman, Z7916 was being piloted by 'Tiger' Lloyd on Ops with 12 other aircraft (6 of 113 Sqd and 6 of 60 Sqd) to Cheing Mei. quote: "Tiger Lloyd was in the fifth position; 'Yoppy' Loan, an Aussie, took off in fourth position and because it was a dirt runway, a lot of dust hung in the air. 'Tiger' thought we had left without him so he started down the strip into the dust. I was flying No 2 and looking down on the strip I could see an IAF Lysander gaily taxying down the center of the takeoff strip. 'Tiger' broke through the dust and saw the Lysander coming towards him so he swerved to the left to avoid the dummy. In the meantime a truck had pulled up to the edge of the strip and stopped. 'Tigers' aircraft hurdled the back of the truck, bounced over and landed in a heap of dust. In 30 seconds, 'Tiger' and his crew had already run a quarter mile, quickly followed by the truck driver. Fortunately no one was hurt. (above per Sgt J Chapman, copyright Air War Over The Arakan by author F/Lt Tony Day) Note there is a photo of this crash. 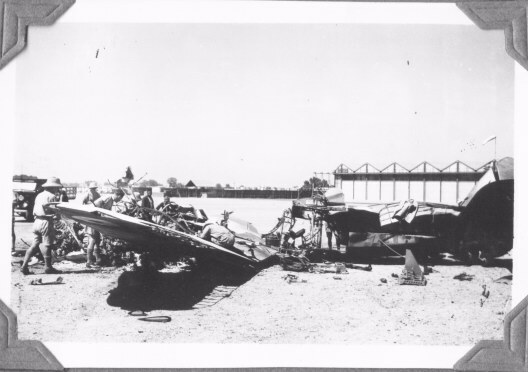 01/03/1942 V6467 MKIV Crashed on take off at Magwe & abandoned there on evacuation. Pilot S/Ldr Ford unhurt and Sgt Scott - Chard slightly hurt. 04/03/1942 Z7783 MkIV* Magwe 1500hrs F/Lt Lee and crew, Sgt Brett (0), Sgt Walker (G) with three crews from 45 Squadron carried out a bombing attack in the Sittang river area. F/Lt Lee was flying in No 4 position. The formation was flying at approx 1,500 feet when attacked by enemy fighters, believed to be Navy "O" type. F/Lt Lee left the formation and dived to ultra low level in an attempt to escape but was attacked by four enemy aircraft, three astern and one in front. The pilot was hit by a bullet and the aircraft crashed west of the Sittang River, and 60 miles east of Pegu. The gunner, Sgt Lister Walker, climbed out and the pilot attempted to do the same but was fatally shot and fell back into the cockpit which was by then afire. The gunner attempted to pull F/Lt Lee out from the cockpit thinking he was wounded, but as the bullet wound was in the head he realized it was fatal. He then looked for Sgt Brett the Observer, whom he found 50 yards from the nose of the aircraft, dead, with his head smashed in. Sgt Walker was then obliged to shelter under the tail of the aircraft while the four enemy aircraft made four strafing attacks. Later hearing artillery fire to the N.E. he walked in the opposite direction & after two days with friendly Burmans arrived at Thamatpin, approx 15 miles east of Pegu. Reporting to Capt. Ince of the Burma Rifles, Sgt Walker was given transport to Army Brigade HQ and thence to Rangoon, ultimately reporting to 113 Squadron. The aircraft was completely burnt out. extract from the ORB's. PRO reference AIR27/878 per the above. Extract obtained from Charlie Walker, son of Sgt Lister Walker. 18/04/1942 V5957 Mk? Destroyed in taxying accident at Asansol. This crash was witnessed by Sgt John Reid and crew who were on this raid, The rear gunner Len White reported seeing a cloud of dust where F/O Hickey crashed which would indicate he did not crash in the river. Sgt Reid reports that F/O Hickey's aircraft was low on the inside of of a steep bank to Port when he noticed Hickeys Blenheim getting very close to the tress and Pagodas. There were Jap troops on the ground in the area and it is possible Hickey's aircraft was hit or he could have hit trees or structure. Given how very low he was and that he was a seasoned pilot it is almost a certainty he had been hit by groundfire. 23/04/1942 Z9803 Mk? Swung on landing at Chittagong and under carriage collapsed. 25/05/1942 L7965 Mk? Tire burst on takeoff at Asansol, crashed and caught fire. Sgt. Kitchen , Pilot, Sgt Hulme Obs, severely burned, Sgt Simpson WOp/Ag concussed. 06/06/1942 Z7758 Mk? F/Sgt Fred Banks (Freddy) and crew Sgt William Drake WOp/Ag, Obo unknown, took off from base at 8.46 a.m. on 6th. june 1942 (06/06/1942) as one of a formation, detailed to carry out an attack on shipping at Akyab, Burma. The flight of four Blenheims consisted of three 113 Squadron aircraft ( unknown, Banks, Keys) and one from 60 Squadron carrying 4 X 250 lb bombs. The specific target being a supply ship. Enroute to the target one aircraft returned to base with a problem. (This returning aircraft wrongly listed by others as McGlashan) The remaining three aircraft continued on to the target whereupon the leader of the formation signalled to prepare to attack. The formation with the exception of F/Sgt Banks aircraft then reduced speed and made the attack with bombs falling on both the Jetty and Sampans in the harbour. At some point on the bombing run in on the target F/Sgt Fred Banks Blenheim was hit by AA fire and seen to fall into the sea in flames. Sgt Keys (RNZAF) although also hit and damaged, was able to return to base as did the 60 Squadron aircraft. Sgt John Reid, although not on this particular raid, was a 113 Squadron pilot and knew the crews: quote; "I well remember Sgt Keys telling me about Freddie Banks aircraft being on fire and attempting to keep up with them and they trying to keep a respectable distance, untill finally the aircraft blew up and became a total flamer as it went into the sea. The thought of Freddie Banks fate came to me momentarily when I discovered my own aircraft on fire on the 9th of September." 18/06/1942 Z7892 MkIV FTR from raid to Myitkina. S/Ldr Clifton Harper (Pilot), P/O Leonard Beauchamp (Obs) KIA no record of WOp/Ag. The Orbs state: TEZPUR 18/06/1942 S/Ldr Harper and crew, F/Sgt Tapp and crew, and Sgt Hockney and crew, set off from DINJAN where they refuelled to bomb MYITKYINA. Target was bungalows on the river bank of the supposed H,Q of a Jap General and staff. Owing to very bad weather and 10/10 cloud on way to target, the formation Split and Sgt Hockney returned with engine trouble. F/Sgt Tapp proceeded on his own to the target and on reaching MYITKYINA decided to bomb the aerodrome as there were 4 large twin engined aircraft in it. The bombs fell in a stick at the North East of the runway about 5O yards from the twin engined aircraft. F/Sgt Tapp returned to TEZPUR. S/Ldr Harper who was only seen once after the formation broke up in the clouds was not seen by F/Sgt Tapp over the target and failed to return. S/Ldr C.W.Harper and his Observer P/O A.L. Beauchamp RAAF posted missing as a result of active operations. According to official records there was reportedly no WOp/Ag on board, however it has since been determined the F/Sgt Kevan was beyond any doubt the gunner on this flight. The fact he is not mentioned in any official documents concerning the loss is likely as Tony Day suggests, that F/Sgt Kevan was a last minute replacement. 08/07/1942 Z6155 Mk? Unable to climb out of blind valley in bad weather, Sgt Butcher crash landed the aircraft near Fort White, Burma. F/Sgt Fred Butcher and crew Sgt John Kirkpatrick Obo and Sgt Steel A/G were also injured. 26/07/1942 Z7768 Mk? Engine cut on takeoff at Asansol, swung into mud and tipped up. 09/08/1942 L8446 Mk 1 Struck off charge. 18/08/1942 T2245 Mk? Crashed at Kalihah during internal security flight. F/Sgt Stanley. Goss killed in crash. Crew murdered by local inhabitants. 09/09/1942 V6507 Mk? Shot down in raid with 60 squadron on Akyab, F/Lt O. (Yoppy) Loane, Sgt Tom Barnard, Sgt T. Bell all Australians were KIA. See the Photo Section for picture of attack and story behind this ship. 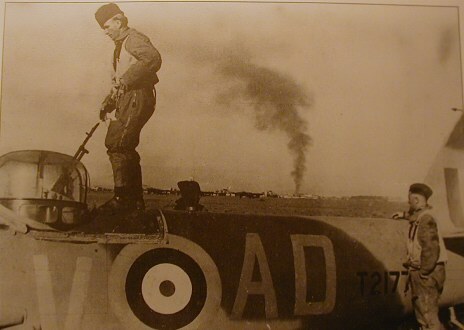 12/09/1942 Z7985 MkIV Two light bombs fell off on taxying out at Argartala and blew up. Aircraft destroyed by fire. F/Sgt M Foster , (Pilot), and F/Sgt L. Tatton nickname Darky (Obs) were badly burned, Darky died later that day from his injuries. WOp/Ag uninjured. Note: The name is Mike ffolliet Foster. PWoodward records the pilots name as Folliett Forte, an American in the RAF, he also states they were heading to bomb Mandalay. page 11 PWoodward booklet. The Australian War Memorial web site references this raid on Mandalay confirming this date and stating both 60 & 113 were involved. A picture of the raid is here on the site also. Chappy Chapman also comments on this crash, see his profile and that of the crew. 28/09/1942 Z7369 MkIV Collided with Z9749 halfway down runway at Asansol and destroyed by fire, Sgt Taylor and crew escaped. Corp Glyn Edwards witnessed this crash: The two Blenheims which touched wings were taking off abreast, bound for Argartala and a sortie over Burma. Piloted by Sgt Taylor and Sgt McLellan, both planes caught fire immediately but the crews managed to get out before the bombs and ammo went up. Debris and splinters went everywhere and I was one of several who dived for cover on this 'scary' September day of 1942 at Asansol. No spares were salvaged from either aircraft. 11/10/1942 Z9598 Mk? Hit a tree low flying giving the ground gunners (RAF Regt) practice at expereiencing lead off on low flying aircraft. All the crew were killed. The pilot was Harry "Scoop" Peters, the Obo W/O Bowyer Pearce,an Aussie, Sgt David Davies Wop/Ag. Chappy who was on leave at the time recalls the tragedy as Peters owed Chappy $40, which obviously Chappy did not recover. 11/10/1942 Z9590 MkIV Engine cut on take off at Assansol & crashed, flown by Wal McLennan RAAF attached to 113 from 45Sqd. 10/11/1942 V6491 MkIV (*see note A*) Shot down by flak in raid on Akyab. W/O Conan T. Allen (Canadian) , F/Sgt Jim. Williams (Navigator) , Sgt Stan Mintern WOp/Ag KIA. Sgt Gerloff in W/C Walters crew witnessed Sgt Allen's aircraft V6491 roll over on its back and plunge into the bay inverted believed to have been hit by flack. NOTE *A* Graham Warner Blenheim book page 563 identifies a picture of a 113 Blenheim crashing into the port at Akyab on 10/11/1942 as being V6491 and states the crew was killed. An extract from squadron records supports Warner and indicates this aircraft was Allens. This photo has also been identified by John Reid as his aircraft V5589. F/O Pat Woodward in his book, No 113 Crusader Squadron, A Brief History, identifies the aircraft in the picture as Sgt Reids, the picture being taken from the aircraft of the C/O W/Cdr Walter. See the Photo Section for picture of attack and story behind this ship. NOTE ALSO: THE CWGC HAS THIS CREW INCORRECTLY LISTED AS 133 EAGLE SQUADRON which was a fighter squadron & never in the ME. (Hard to fit a crew of three in a Hurricane). 16/11/1942 AZ864 Mk V, Sank back on attempted overshoot at Asansol and crash landed. 18/11/1942 BA396 Mk V. Tire burst on landing at Dum Dum and under carriage collapsed. 30/12/1942 BA592 MK V Upon landing at Feni, the brakes were found to be ineffective causing the aircraft to swerve and the undercarriage retracted which in turn broke the starboard mainplane as the aircraft came down on its belly. The pilot Sgt Smith and crew Wop/Ag Jack Barnes were uninjured. It is unknown yet if the aircraft was SOC. SOURCE: Log of Jack Barnes. 10/02/1943 BA452 Mk V. Per the official record: Tire burst on landing at Feni, swung and under carriage collapsed. Per What supposedly Happened: The following is an edited story of this crash as related to Tony Day by Sgt J Chapman. Quote "Concerning the 360 degree traverse of the turret, there is quite a story. The Squadron was on a raid down the Arakan coast and Gus Alder's gunner decided to test his guns in the forward position when the formation was near Feni. The gunner, an Aussie named Brooks, fired his guns which turned out to be out of line and some of the bullets found their way into the pilot's cabin, one of them glancing off the back of Gus' head. He eventually made a crash landing at Feni, the aircraft being BA452. All, Gus had was a large sized headache and a small hole that required a few stitches to close". Excerpt copyright from Air War Over The Arakan - Tony Day Note in F/Lt Day records, he indicates incident similar to records in that tire burst on take off at Feni, W/Cdr Jones is noted alongside. 19/05/1943 BA920 MkV. Starboard flap failed on approach to Comilla, crash landed in a paddy field. F/O Webster , F/Sgt Whyte , Sgt Cheshire uninjured. 06/06/1943 BA916 Mk V Crashed on overshoot near Comilla on return from aborted raid to Kalemyo. F/Sgt Les Ward - pilot , F/Sgt Ray Gilchrist - Navigator , Sgt. Gerry Theobald - Air Gunner were all KIA. According to W/O Jack Barnes, this date 6 Bisleys attacked jap concentrations at Thaizang with bombs seen to burst on North side of village. The runway was under repairs at the time and there were hundreds of natives on and around the strip carrying baskets of rubble on their heads. Pilot F/Sgt Ward was forced to go round several times before he could land and as Jack recalls the plane stalled and crashed in flames. Note: W/O Barnes log confirms target Thaizang and one Bisley lost this date. 12/06/1943 BA590 Mk V Swung on landing at Comilla, aircraft destroyed. 23/06/1943 BA607 Mk V Aircraft hit the sea for reasons unknown and crash landed on beach. FLt G. Brew , (pilot) uninjured. F/Sgt W. Facton (Obs) injured. 24/08/1943 EH460 MkV Crashed in forced landing in River Sone, one of Sgt Padley's crew injured. 31/08/1944 Z7857 MK ? SOC. Used on radar calibration at Argatala, flown by Wal McLellan after his two prangs in a row. NOT POSITIVE THIS WAS A 113 Blenheim. Source Author F/Lt Tony Day research notes. The following are extractions from various logs for research purposes and represent other aircraft the 113 was known to have flown and that may or may not be listed in the losses section. V6438 S/Ldr Mann with Checketts, not 113 maybe. Z7791 piloted Lt. J Viney and his crew Wop/Ag. Sgt. John Wohlers, Nav/B Sgt Ewan Brooking, From Egypt to Burma. * 5594 Force landed in the desert 3 miles from LG76 which is 40 min from Quasaba. F/O Scoones pilot, Sgt Lister Walker A/G. It is unknown if the aircraft was recovered. V6328 18/12/1943 Crashed on take off Kanchragra ? ?